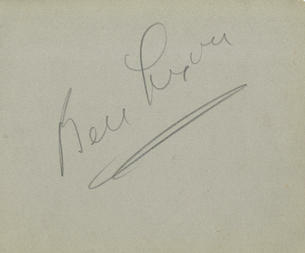 This is a Hand Signed Autograph Album page in pencil 4.5" x 3.5" by the late American actor. Ben Lyon (February 6, 1901 - March 22, 1979) was an American film actor and a 20th Century Fox studio executive. Born in Atlanta, Georgia, Lyon entered films in 1918 after a successful appearance on Broadway opposite Jeanne Eagels. He attracted attention in the highly successful film Flaming Youth (1923), and steadily developed into a leading man. He was most successfully paired with some of the leading actresses of the silent era including Pola Negri, Gloria Swanson, Colleen Moore, Barbara La Marr, Viola Dana, Anna Q. Nilsson, Mary Astor and Blanche Sweet. His greatest success as an actor came in 1930 with the film Hell's Angels. The film was a major success and brought Jean Harlow to prominence, but Lyon's performance as an heroic World War I aviator was also highly regarded. For the next decade he was constantly in demand, but his popularity began to wane by the early 1940s. With Gloria Swanson in IndiscreetBy the mid 1940s he was working for 20th Century Fox. In 1946 he met a young aspiring actress named Norma Jeane Dougherty. After his first meeting with her he stated that she was "Jean Harlow all over again". He organised a color screen test for the actress, renamed her, and finally signed her as Marilyn Monroe to her first studio contract. In 1930 he married the actress Bebe Daniels. Together they were a notable couple in show business society, and sometimes acted together, including a long-running BBC radio show Hi Gang. Hi Gang was succeeded in 1950 by Life With The Lyons, which also featured their real life son Richard and daughter Barbara, and had a run on BBC and independent television from 1954 until 1960. When Daniels' health declined during the 1960s following a series of strokes, Lyon cared for her until her death in 1971.